To read this passage online go to http://bible.oremus.org/?passage=Esther+7:1-10&vnum=yes&version=nrsv and http://bible.oremus.org/?passage=Esther+9:20-22&vnum=yes&version=nrsv. The Book of Esther is a strange and difficult book for several reasons, first and foremost because it seems to be non-theological. There is no mention of God or God’s Presence. There is no praying or worship. But the book is very important to Jews because it records the deeds of a woman who was prepared to risk everything to save her people from the threat of genocide. She is a heroine and her story is the basis for the Festival of Purim, at which time the whole book is read in the synagogue. On that holiday, the story is told of a beautiful young Jewish woman in Persia named Esther and her cousin Mordecai, who raised her as if she were his daughter. Now the king has divorced his queen, Vashti, and wants to take a new virgin bride. Esther was taken to the King’s house to become part of the harem, where she was loved more than any other woman by the king and made his queen, because he did not know that she was a Jew. The villain is Haman, an arrogant advisor to the king, who plots to destroy the Jewish people because Mordecai will not bow to him. 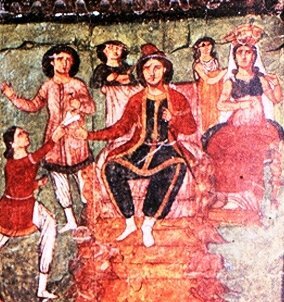 Mordecai persuades Esther to intercede for the Jewish people with the king even though this was very dangerous for her. Esther fasts for three days to prepare herself and then goes to the King. The Jewish people were ultimately saved and Haman was hanged on the gallows that he had prepared for Mordecai. Esther is depicted as a hero, a clever and faithful model of courage. Rather than staying in the comfort and safety of her life, Esther stood up and spoke out in truth and love. As I mentioned before, there is no mention of God. There is no real religious motivation for anything that anyone does in the story. So what do we do with a Biblical story where God is NOT inherently and obviously made know? What do we do with a place where God is not? Well, the truth is that God probably was not missing from this book at all; rather, God’s Spirit and God’s way of moving us to be who God envisions us to be is sometimes not as obvious as wind or fire but is rather embodied in the very Creation, the very humanity that God shaped into the image of the Godself. It is, then, a story of God, embodied. God is always and forever still God but maybe this story is a reminder that God does not control the world with seemingly robotic movement but rather breathes a piece of the Godself into each of us. Perhaps, then, the will of God has nothing to do with fate or plans or some sort of pre-ordained destiny that is laid before us and on which we must tread but is instead handed to us for such a time as this. Perhaps those places where it seems that God is not are the places where we are called to be. Because, when you think about it, if we truly believe in God as an omnipresent otherness in our life, then how can there ever be places where God’s Presence is not? Room to step forward…maybe that’s the whole point. Maybe that’s what the Book of Esther is about—the story of one who responded to the room God made to step forward, to act not upon our individual understanding of God but rather to respond to who God envisions God to be. And maybe that’s what this dance with God is. We don’t “get to” God and then check it off our spiritual “to do” list; rather, we let ourselves feel the rhythm of a God who sometimes holds us, sometimes takes us by the hand, and sometimes steps out onto the floor with a new beat and a new song and waits on tiptoe hoping that we might courageously and faithfully move to a place we’ve never been before. There is so much work to be done. I don’t really think that God ever envisioned doing it all for us; otherwise, we would have been mere robots in the world and God would have instead sat there as some sort of divine programmer. And, really, if that were the case, why would God have had to walk with us on this earth at all? I mean, really, that was a whole lot of trouble for God to go to if God was just going to do everything anyway. Instead, God created time and space such that we are experiencing now, stepped back, and called us to fill it with God’s love and God’s grace and the piece of the Godself that we are called to show to the world. God not only gave us the gift of God’s Presence but with a wisdom only God could know, also gave us the gift of a holy absence that makes room for us. You see, that IS the very Presence of God. So what are you going to do with the room God made for you?